Heat Resistant Dish Drying Rack: Our Roll Up Drying Rack is thermoresistant, and can resist up to 450F. I have a standard double sink, and this takes up about 1/2 of one side. Plenty of room to wash on one side and leave a few items to dry on the other, without completely eliminating use on the other side. SO happy I bought this! No more wasting paper towels and leaving drips all over the counter when I need to hand wash something. Love this rack!! Adds working space to my kitchen by covering the majority of one of my kitchen sinks. 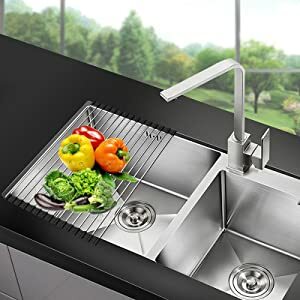 Use it mainly for cleaning fresh veggies and fruit. I�ve also used it to set a large pot on while filling with water, so I don�t have to hold the pot. Since it�s not dishwasher safe, I seldom use it for meat... but when needed, after washing with hot, soapy water, I spray it with Clorox everywhere to sanitize it, let it dry, then rinse again with hot water. When dried, I roll it up and it�s ready for use the next time. Can�t say how much I LOVE this rack!!! Extremely happy with this roll up drying rack. I use it a lot for items that I use regularly, that I can't wait until I have a full dishwasher load to get them clean. I store it under the sink, stands on its own while rolled up so it is out of the way and within reach when needed. 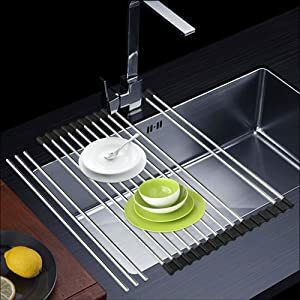 My BF absolutely HAS TO HAVE a dish dryer even though we have a dishwasher and this one is so much classier looking than an old plastic dish dryer. I love this thing. I have exactly one counter that's connected to my sink. Before with the standard dish rack, I had to use all of my counter space just to dry dishes. Now I have freed up, almost, my entire counter. Fits my tiny double sink perfect. I think it cuts down on the drying time for my dishes too. Before it seemed to take forever for my dishes to just air dry. Now, it seems, to take far less time before I can put the dishes away. It could be all in my head. Pretty durable, too. My two-year old got a old of it and used it with her "kitchen". Nothing was damaged and the rubber ends stayed on. Would definitely recommend this to anyone. This rack does fit over my sink, but I mostly use it as either a drying rack or a heatproof �trivet� on the countertop. 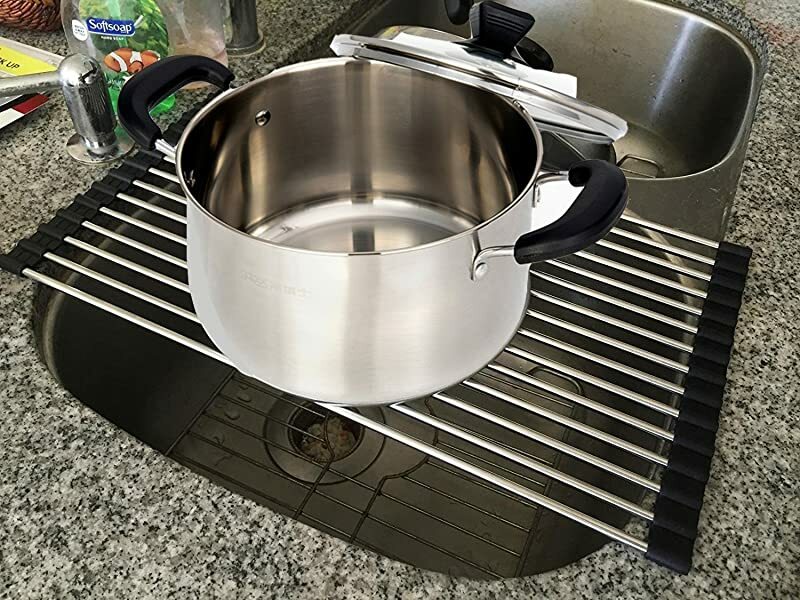 When I'm cooking, I often already have things on the stovetop; another pan coming out the oven needs a place to rest and this rack serves that purpose well. I keep a dishcloth under the rack just to catch spills or drips. One star off because I wish the rubber ends were a little thicker, so the rack would sit a little higher when flat on the countertop. Love it, use it and it's so handy! I give it 4 not 5 because after a while it starts looking shabby. The black rubber gets worn looking and the stainless steel gets dull and scratchy. They are inexpensive enough to replace though when they start looking that way after several months of use. I would buy it again if I felt I needed to. Why didn't I know about this sooner? Makes pretty much every sink related chore SO much easier. Being able to have items at counter height in the sink makes it so much easier to fill and lift a large pot of water, wash a large pot or other object. No more putting 'whatever' in the sink then having to lift it back out again. So much easier on the back. Then it rolls up and tucks neatly into a drawer. Great product. Highly recommend. Where has this been all my life? I love this thing. I have these awesome silicone placemats for my kids (and my messy husband, let's be real) and I was having an impossible time of washing them. Now I can lay them on this little drying rack, wipe them down, and then hang them to dry between the drying slats. And then the whole thing rolls up and goes to the side. Fantastic. Would recommend for many purposes. So far so good, I�ve had it for about 3 months and I have set up like in the pictures. I have a dish holder on top and works awesome. I have two little ones so dishes add up quickly. I try to clean it like once a week, it doesn�t bother me since I clean my sink. I bought the small one so I could put dishes on the bottom.